The emphasis on STEAM education – science, technology, engineering, the arts and math – has swept into public education from grade schools to school boards, as districts embrace those subjects as crucial for both student success and global competitiveness. The New Jersey School Boards Association has made STEAM education a major focus, with many training programs and opportunities offered for school districts to enrich student learning in those areas. As the school year begins, a new voice is collaborating with NJSBA in the effort to put the “A” in STEAM. 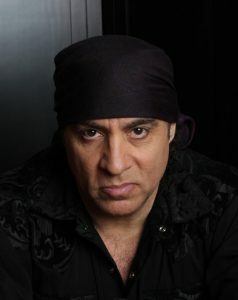 Rock musician and actor Steven Van Zandt, founder of the Rock and Roll Forever Foundation, has formed a collaboration with NJSBA to provide teachers and administrators in New Jersey’s public schools with free access to arts-based, STEAM-aligned professional development and educational materials. Raised in New Jersey, Van Zandt cut his teeth playing with Bruce Springsteen and other musicians in the Jersey Shore rock scene in the 1960s and 1970s. A multi-talented artist, Van Zandt has formed numerous bands; is a key member of Springsteen’s E Street Band; writes and produces songs and albums; and this summer, toured Europe with his new solo album, “Soulfire.” The member of the Rock and Roll Hall of Fame also segued his talents to acting, performing in productions such as TV’s The Sopranos; and producing, co-writing and starring in the Netflix series Lilyhammer. Van Zandt took a break recently from a concert tour stop in Copenhagen to talk with School Leader about arts education; the Rock and Roll Forever Foundation; his experiences working with Bruce Springsteen and James Gandolfini; and his commitment to strive for greatness. Van Zandt’s interview with School Leader follows. Q. Tell us about the Rock and Roll Forever Foundation, which you started in 2007. Why did you choose to get involved in promoting the importance of the arts in schools? A. Well, it actually began with music teachers coming to me, after the No Child Left Behind legislation had the unintended consequence of devastating arts classes across the country. Arts classes suddenly disappeared, in favor of the new priority of science and math. Ironically, all statistics show that if kids take music class, they do better in science and math. I went to Capitol Hill, and talked to (U.S. Senators) Teddy Kennedy and Mitch McConnell, they said “It’s a shame, we didn’t really mean for that to happen, but basically it’s not going to be fixed anytime soon.” I came back to the music teachers, and said we’ll attempt to do things privately. Which I did with Little Kids Rock, an organization which provides guitars to kids. But I thought a more fruitful project we could embark on is writing the history of music, and getting that into the educational process, probably centering on middle school. I outlined 200 lessons, and we hired people who are very knowledgeable about the education process. I wanted to make sure we met all the state standards, we’re not just an after-school class. So that’s what we did over last 10 years. We have 100 lessons up online, which are free for the world. We license the music, we license the video, we have lots of partnerships. That’s what we do. Q. At NJSBA, we are excited to have a collaboration with you and the Foundation, because we are also very involved in furthering STEAM – science, technology, engineering, the arts and math. How did you decide to link with our organization? How does collaborating with NJSBA, and local school boards, help your efforts? A. First of all, I was thrilled to see STEM turn into STEAM. That was a wonderful evolution. Then, we really just have gone public recently, I wanted to make sure we had enough content before we started offering it. Coincidentally, the connection happened – maybe from the commencement speech I gave at Rutgers – I’m not sure where the initial connection came, but I’m happy it did. Our goal is to be in every single school system, every single grade, every classroom, when we’re done. The idea is based on one simple thing, kids are experts in one subject, and that is their own taste. Every kid loves music. Let’s establish that as a common ground. What is the biggest job for a teacher? Getting the kids’ attention. We figure, let this be the class where you say to a kid, “Don’t take the iPod out of your ears, but tell me what you’re listening to and trace it back. Show the context of what’s going on in the environment at the time.” As kids learn about the music they love, they also learn about history, from social studies to English class to music class. We’re hoping, once we have established ourselves, to be in enough classrooms to actually begin to affect the dropout rate. Statistics show that if a kid likes one single class or one single teacher, they’ll come to school. We hope to be that class that gives them the energy and connection and take that energy to every other class. New Jersey couldn’t be a better place to start. Q.Tell us about your background. You’ve done everything in rock music, it seems – formed your own bands; been a member of Bruce Springsteen’s E Street Band; you’ve written and produced songs and albums; toured the world. You’re an actor, too, who played Silvio Dante in TV’s The Sopranos, and other roles. How did you get started on your career in the arts? How did you achieve success, and can you offer any advice for students? A. I don’t know if I’m a great example but really, for me, I just didn’t have a whole lot of choices. I wasn’t very good at anything else. I was attracted to the arts and in my case, music, just out of circumstance. It was a time when suddenly we were introduced to the concept of a band, which we’d never seen before. There had been individual singers, singing groups, instrumental groups, but there had never been a band that was singing and playing and writing their own songs. That was a new idea when we first saw the British Invasion. Rather than the individual thing of “look at me,” it was, “look at us.” It became more of a family and friendship. That communicated community to me. We had music class in school, which was good, but this was the early days when rock and roll wasn’t taken for granted as mainstream. It was an underground thing. Music teachers were usually hip enough to encourage it, but mostly we had to learn on our own. I just stayed with it. When it comes to craft, nobody’s born great. It’s something you really have to work at, and it’s a decision you make every day: “Do I intend to reach for greatness today?” We were in luck in that we were surrounded by a level of greatness the world will never see again, I refer to it as a Renaissance period, the 1960s. Our standards were set very, very high and we have been reaching for that greatness ever since. We didn’t have any success, Bruce Springsteen and I, until 15 years after we started. That’s a long time. We started playing when we were 15, and we didn’t have any big success until we were 30. You work at it day after day. The main thing is to measure yourself against greatness. When it comes to your craft, measure against the best and keep reaching for that. Q. You talked about the importance of arts education when you were the Rutgers University commencement speaker in May. How did the arts help you, as a student? A. For me, I was already there. I was one of the lucky ones who knew what I wanted to do at an early age. I knew at 13. But for the typical person who’s not a musician, who’s not necessarily an artist, the arts are just as beneficial to them. The arts are an essential part of the quality of life, it’s that which comes from the best part of us, helps explain life, helps illuminate life. It is part of the basic essential quality of life. We are the only country in the world that considers art a luxury. Every other civilization, it’s always been an essential part of the education process, with the exception of the U.S.A. That’s a shame and we need to rectify it. Q. You’ve worked with some incredible talents. Southside Johnny, Bruce Springsteen, the late James Gandolfini on the Sopranos, to mention a few. Have you learned something from each of those talents? Can you share anything specific you’ve taken away from working with each of them? A. Bruce and I were the best of friends mostly because we were uncompromising in our dedication to rock and roll, which was unusual back then. It wasn’t quite a legitimate business, but we didn’t care, it was just something we both needed. His uncompromising attitude always strengthened me and I think the reverse is true if you ask him. As far as Jimmy Gandolfini, he was somebody who was very much a working class guy. What would have been known as a character actor, who suddenly was cast as a lead. There are certain personalities that lead one to be a celebrity, a leading-man type of star, and some that lead one to be more of an ensemble guy, a collaborative guy. That was his natural personality. He colored the entire tone of the set. There was never any prima donna, diva type of activity; he was always very humble, a terrific dedicated craftsman. I would do a scene with him, and walk away a better actor from the quality of his work. It all comes down to high standards, high quality, and craft. Those are the elements that make up a successful career. Southside, he was a guy who again was very humble. I think I imposed a bit of ambition on him. In the end it turned out to be fine. He was just a working-class sort of guy who was suddenly pushed into the spotlight. Q. How does the Rock and Roll Forever Foundation, and TeachRock, work? On the website TeachRock.org, there are a number of very cool-sounding lesson plans – “Dylan as Poet,” “The Birth of Rock,” “The Many Roles of Producers in Popular Music,” and more. Plus there are professional development resources. Who created the materials? Are teachers and school districts free to use them at no cost and, if so, how do they get involved? A. Yes, I outlined 200 basic lessons covering the history of music from the early 20th century, and along the way we do special projects. It creates a bit of synergy between what’s going on in the media and what’s going on in the classroom. It’s all for free, we recently expanded the website. We would like you to join, to tell us who you are and where you’re teaching it. There’s no charge. We will eventually have a monthly newsletter, right now there’s a lesson every two weeks. We’ll eventually build up enough educators and lesson writers, maybe it will increase to one per week. Q. We’re approaching the start of a new school year, here in New Jersey, and of course elsewhere. Do you know of schools in New Jersey that will be using TeachRock lessons? Have you gotten feedback on the program and, if so, how has it been? A. I don’t know numbers, but we have pilot programs all over. We get lots of positive feedback, once in a while suggestions, which we welcome, as to a subject we didn’t think of or something like that. We’ve not received a negative word, whether from teachers, administrators, school boards; everybody just loves this thing because everybody’s into music. You can’t go wrong. And it’s a great introduction to arts in general. Anything we can do to strengthen that part of STEAM is wonderful. Q. How do you see the Foundation, and yourself, promoting arts education going forward? A. We’re doing it. When we are in enough classes, the goal is to have any single artist, any musical artist who is on tour, be able to go into a local school and take part in a class. That’s our ultimate goal. It will be a constant promotion in that sense. A constant pleasant surprise for kids when artists will just drop in and take part in a class. We’ll have every genre covered, from country to hip-hop and everything in between. Jazz, classical, Broadway, we’re going to eventually have all bases covered. I’m very proud to have our first statewide partnership be New Jersey. It couldn’t be more appropriate and I couldn’t be more proud. Thank you for having the open-mindedness for inviting us. For more on The Rock and Roll Forever Foundation, please visit the Foundation website. Jeanette Rundquist is NJSBA communication officer.